You have probably noticed, as I have, that western fiction containing aliens often plays with the old “We come in peace” subterfuge. False because, of course, we all know from the beginning that the invaders will be horrible, nasty, creatures bent on enslaving (and/or eating, interior decorating with, organ harvesting from, farming for pelts, eradicating, experimenting upon) the human species. Aliens bad; earthlings good. It’s simple and obvious. Except for that little part where we also all know from the beginning that humans are flawed, damaged, and often horrible and nasty, even to each other. There’s a little earworm that plays a constant repeating loop of the first line of that song ‘I Fall to Pieces’ with a cheerily cruel ironic tone when I think about how people tend to interact with each other, especially when we become obsessed with our differences and forget we’re related. I’m more than a little suspicious that if aliens ever do show up openly on our planetary doorstep, we’ll be far too busy tripping over ourselves and each other, and mucking up our own existence, to be bothered with figuring out whether the extraterrestrials are in fact here to harm or help us. Might as well be the latter, or they’re better off sitting back on their alien haunches with snacks and watching from the comfort of their spaceship windows while we bicker like fools and self-destruct without any help from them. I, of course, will be hiding in a closet with my wallet and most prized electronics clutched to my chest to protect them through the invasion for use in my privileged position after the overthrow of the world rightfully makes me the aliens’ designated deity. If you’re uncomfortable with reading about illness or medical stuff, skip the rest of this post and know that it’s about my having been sick but still being alive and well enough to write the post! And I’ll see you tomorrow. ‘Bye, now! Saturday, sometime in the mid-morning, I started feeling less than fabulous. A slight pain around my middle started to come and go in varying waves, accompanied by a host of related symptoms that something unpleasant was lurking inside. From then into Monday evening, the symptoms worsened between shortening periods of calm. I was irritated, as much as anything, that I felt just as lousy as I had at the beginning of this month when I paid that previous visit to the Emergency Room and went home with a flu diagnosis and antibiotics, albeit feeling much better, on my release, for the ER treatment I’d received. It was more than a little irksome to think that I would have a case of gastroenteritis strong enough to make me think I had kidney stones not just once-ever, but twice in one month. Monday night was kind of ugly. I already felt rotten at bedtime, enough so that I sent my spouse off to our bed by himself and tried to get comfortable enough to sleep elsewhere, since I felt too awful to lie flat. After hours of perching awkwardly this way and that on various pieces of furniture and the floor, alternated with pacing and a multitude of trips to the loo that were neither especially productive nor reassuring, I was no better, a bit worse, and much more anxious. I couldn’t even decide whether the success of those anti-nausea pills I’d been given but not needed after the weeks-ago hospital jaunt was that much of a boon, as (having taken one now) I was glad not to be spitting out my soul in a foul fountain of retching wretchedness, but still felt horridly nauseous. And I was loath to wake my beloved and have him drag me off to the ER again not only because I felt a bit like I was ‘crying wolf’ and just going to get hydrated, mollified, and sent off home again, but more importantly, because the upcoming day was the final day of recall-auditions for my guy’s larger university choir, after an already intense four days of preliminary auditions and the complicated, concentrated consideration of who would come together to make the fittest, most balanced choir out of the 180-some singers who had started the audition process. All of that agonizing of his, and mine, went out the window by 3:30 yesterday (Tuesday) morning. I just plain felt horrible, and it wasn’t showing any signs of stopping. Fifteen minutes later we were off to the hospital again. I had the good fortune to be taken in instantly and examined by the night’s ER team in rapid succession. I had virtually identical symptoms to those of my previous visit, so the tests and questions were pretty much as expected. The one benefit, I suppose, of my having waited longer this time was that although I’d had longer to feel bad, I’d also had those brief windows of feeling marginally better, and thinking I’d kicked the bug or it had at least retreated, I’d been able to eat a bit at times and, more importantly, drink fluids, so I wasn’t nearly so dehydrated. The immediate bonus of that being that on ER intake, I did actually have more than a half-teaspoon of fluid in my bladder when asked for a sample. That ‘donation’ of mine should have been easily more healthy by mere reason of better hydration in the days and hours preceding the visit, but it was concentrated and looked orange. The latter, it emerged, was because it contained a bunch of red blood cells. To my surprise and, I think, to the ER doctor’s. Because everything was generally pointing flu-ward again. He’d generally ruled out appendicitis (yay!) and heart attack (YAY! ), but said that this small curiosity was not one to be brushed off casually, so he sent me down the hall for a CT scan. Where, in a couple of pictures that looked comically like those prenatal sonograms with their adorable babies waving in amniotic bliss, my “baby” was a little alien blob, quite egg-like in shape and about the size of a brand-new pencil eraser, perched slightly below my right kidney. My own personal meteorite, staking its territory inside and making me feel kind of nasty and more than a little ticked off at its invasion. Let me just say that I don’t fault the previous ER doctor in any way for not finding this, although I can’t imagine by any stretch that it took less than a month from start to finish for me to produce a stone of this size. It was already there, and on the move. But because of its size, it seems entirely possible to me that the thing hasn’t wandered as much as typical kidney stones, not having so much room to maneuver, and so has paused at whatever cubbies and intersections it could squeeze into, thus having those in-between times of stillness when my system could temporarily adjust and not keep actively trying to evict it. Still, it would have been nice to uncover the culprit by showing the right symptoms on first try, rather than having to come back for a sequel. The sequel to this actual diagnosis should have been straightforward enough. Question: is it small enough to ‘go through the pipes’ and leave under its own momentum? Answer: not likely. Safe to guess that passing a pencil eraser through plumbing that narrow would be ugly, if not impossible. Impassable. The doctor’s recommended urologist happened to be ‘in the house’ at the time of my visit, so he was consulted on the spot and tentatively recommended ESWL (extracorporeal shock wave lithotripsy), to be done at his outpatient clinic after a consultation. That consult happened earlier this afternoon. Tomorrow (Thursday) is the procedure. Yay? Meanwhile, back at the ER, among the many tests administered were those aimed at determining whether I’d had or was having a heart attack, despite the complete lack of chest or arm pain on my part. I’ve read that women’s heart attacks do sometimes present less obviously than men’s, and of course, that anyone can have an anomalous episode of pretty much any ailment. So I wasn’t alarmed. But my heart enzyme levels were just enough higher than expected that the ER doctor decided to monitor them, strictly for insurance and assurance if for no other reason. That’s when the second-most unexpected element of the whole episode came into effect. He had me admitted to the hospital for overnight observation and re-testing of something almost entirely unrelated to the cause of my hospital visit in the first place. The downside of this was, of course, being put in the hospital. First, and I hope last, time ever. Chances were fair that any elevation of the enzymes might have been attributed to the stress and pain of having a kidney stone, not to mention the concomitant upset of having to go back to the hospital for diagnosis and treatment. As there was little worry on my part that anything dire was about to be revealed about my heart, and I already felt worlds better for having been ER-treated for my pain, the prospect of my observational stay in the hospital wasn’t frightening. I decided to treat it as a cosmically granted day of education and R&R. So while I don’t recommend hospital visits as either a cool substitute for a community college night course, let alone an even trade for a spa vacation, I found I got a few similar values from it overall. As the twenty or so professionals who took over my life and well-being for the remainder of my stay were unfailingly kind, patient, and willing to answer any question or explain any mystery, I found them to be highly informative company. As the majority of them were also tremendously gracious and good-humored, they were just plain good company—the sort I’d happily visit with over lunch any old time. Assuming I didn’t require a morphine cocktail just to sit through lunch, on the day. Hospitals being what they are, I wouldn’t necessarily trade the amenities of a designer-decorated seaside spa with its celebrity chef and rose petal-strewn massage chamber for a place where even the sweetest people are wont to wake you every twenty minutes to two hours to stick needles in you, squeeze your arms and feet, ask how often you’ve visited the toilet lately, or—without a trace of sarcasm—ask how you’ve been sleeping. But (hospitals being what they are), I had a fairly peaceful and definitely worthwhile recovery from feeling anxiously, very uncomfortably, unwell. Now, if I can just get this blasted nephrolith blasted. Delightful as it is to learn all kinds of new and interesting things about my heart through my echocardiogram yesterday, about hospital procedures and history through talking to staff, and about yet more of my million limitations as a frail humanoid creature through the last few days’ adventures. Oh, and I learned why I’ve always been so averse to mathematics: internalizing calculus turned out to be a regrettably vexatious experience for me. Here’s to ejecting the little pest and returning to my delightfully dull self! People traveled for days to see it. The warm gleam of copper and brass on its mysterious curved reflected their own faces, if a little blearily, and they were mesmerized. The ticking and clicking of that machine and its workings’ purr and whirr drew whispered speculation and quietly fearful puzzlement and some observers began to contemplate whether they oughtn’t to summon the constable ‘just in case’ before the process was completed on the morrow. Yet so much study and work and testing had been reported before this debut of the machine that no one was fully prepared to admit so brazenly to such cowering mistrust. So at last, on the appointed Friday, six of the town’s leading citizens—with a few nervous titters and a little confused shuffling and tripping over each other—untied the network of cautionary tapes that had held back the crowds, and everyone surged up in a breathless wave for a closer look. There it was: coming forward on the slow conveyor belt from its central tank was a very small but perfect object of glowing copper and brass curves, ticking and clicking and purring and whirring just like its larger forerunner. It was followed, as the conveyor moved along, by ninety-nine other minutely perfect replicas. And that is how the world had its first hint of what lay ahead. The interviewer from Wagging Wonders paused. Biscuit cocked her head thoughtfully, now reminiscing about her youth. 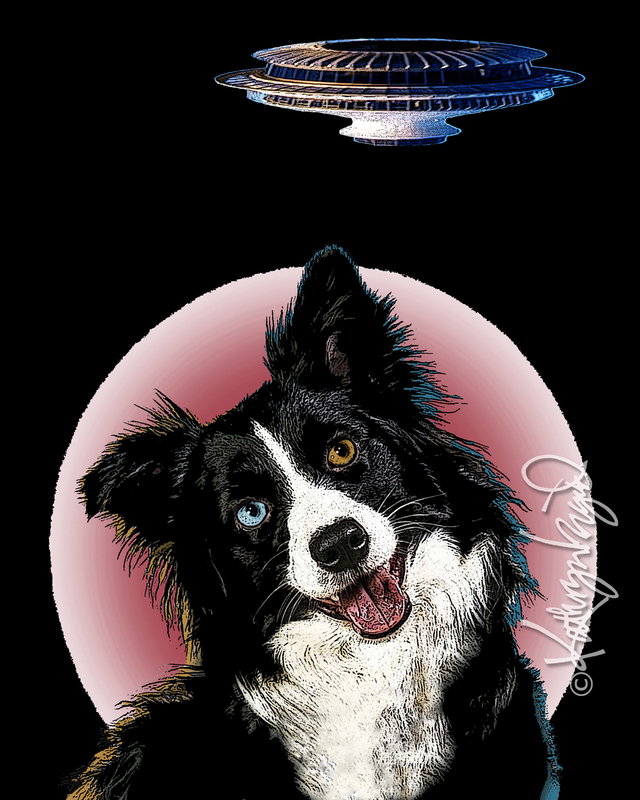 In the old days, before the invention of the Frisbee®, dogs had to be so much more clever and agile to chase and catch those passing spaceships. Pups these days! They have no idea how easy they have it. Why, if it hadn’t been for Biscuit and Sprocket, all of Montana would’ve been overrun by those little orange beings that dodged their yipping and nipping, landing covertly in Seattle instead, in ’62.